The New Zealand U-20 women have pulled off one of the most notable results in their country’s history after holding France, tournament hosts and one of the favourites to lift the trophy, to a nil-all draw at the FIFA U-20 Women’s World Cup this morning. In an absorbing encounter played at a high intensity throughout, France dominated possession as expected in front of their boisterous fans but New Zealand had a clear game plan and executed it to the letter to keep their hopes of progressing past the group stages alive. They must now beat Ghana – who are pointless after two matches and have already been eliminated – in their final Group A match on Monday and hope the Netherlands can do them a favour by beating France. “I’m really proud of the performance from the girls, we set them a pretty honest challenge to be better in certain areas from the first game and they certainly delivered on that today,” coach Gareth Turnbull said. New Zealand had performed well in their opening match against the Netherlands and very nearly claimed a point on that occasion too, only a late winner denying them in heart-breaking fashion. While pleased with many aspects of that showing, Turnbull had asked for even more from his players against France and knew that would be necessary to successfully take on a side of such standing in their own backyard. Recently crowned world champions in the men’s game, France finished runners-up in the previous FIFA U-20 Women’s World Cup in 2016 and also came second in the 2017 UEFA Women’s Under-19 Championship as defending champions. Despite being roared on by a vociferous backing at the Stade de la Rabine in Vannes though, they struggled to break down a well-organised New Zealand, whose outstanding performance was built on a heroic defensive effort. Turnbull made only one change from the side that was narrowly defeated by the Netherlands with Jacqui Hand coming in to replace Maggie Jenkins and those taking the field knew they would face elimination if they failed to earn a positive result. But, despite that do-or-die pressure, Turnbull says the feeling in the camp was more relaxed than in that opening day defeat. “We sort of took the pressure off them today, it was more around just bringing a performance they were proud of and letting the football gods determine the outcome,” he said. In a first half of few opportunities, France hardly had a sight of goal while Claudia Bunge had a half chance on the turn early on and captain Malia Steinmetz tried her luck with a speculative effort from distance just before the break. Clear goal-scoring opportunities continued to be at a premium in the second period, Anna Leat being called into action on only a few occasions to make comfortable saves. New Zealand’s first shot on target in the half arrived just before the hour when Hannah Blake laid off a free kick for Grace Jale to drill low but straight at goalkeeper Mylene Chavas. 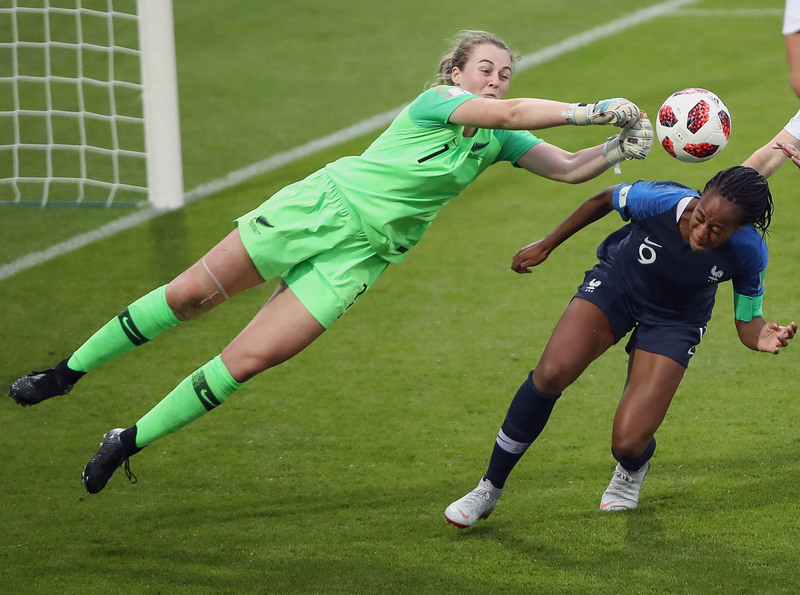 France should have taken the lead moments later when Emelyne Laurent somehow blazed over the bar with the goal at her mercy and the hosts were made to pay as New Zealand safely negotiated a late spell of pressure to record the first scoreless draw of the tournament. New Zealand have now given themselves a chance to progress with a win over Ghana but Turnbull is keeping his feet planted firmly on the ground. “It’s a little bit out of our hands so we’ll just focus on what we can control,” he said.